This morning, coffee in hand, I was so happy that Pauldub and Budd weighed in yesterday sharing their thoughts on bread machines. Budd, I loved that story about passing on your unused bread machine. Ha, ha! Maybe it eventually made its way to that garage sale I bought mine at! Was it a Magic Chef? That is what mine is. Mine is still not out of the box. The reason is it came with one instruction slip. I believe the booklet is missing. I can look instructions up on the Internet, but I just have to know how long it needs. I have a feeling that you do have to be there when the bread is ready, that it can't sit there until you get home. That is what I have to get straight. Otherwise everything is there, all the little attachments. I checked. Everything is packaged beautifully. Yep, this is one unused bread machine! It cost $5. I should have a party when it coughs up its first loaf. Pauldub and Budd, I will invite you! Pauldub, I have to say, you do save money baking your own bread. You do! I am an old hand -- ha -- at kneading and baking my own bread and let me tell you, you do save a lot of dough. Hahahahahahaaa! That is Howard's joke, I have to confess. But before I get into that, I have a story about passing on a bread machine. There are always things that are being passed one to another in my family. Usually what happens is I give things to my mother and she gives them to one of my sisters. Which sometimes makes me mad because often I like the thing, and if she doesn't like it, I would rather she gave it back to me, you know? We had a terrible situation where this Fred Astaire CD I loved had vanished. I had this craving to hear him singing "The Way You Look Tonight" and I could not find this CD. This was something like seven years ago. Eventually I gave up and put it out of my mind. I am always losing things. It probably fell out of the car or something. But then one weekend my sister Margie was visiting from New Jersey and I heard her talking to my mom ABOUT MY CD! "Emily loves Fred Astaire!" she said. "She knows all the songs he sings." Emily, remember, is the gal who grew up to be the New Jersey golf champion. She is now 12 and the Monmouth County Women's Amateur Champ. I can't find a picture of Emily in her golf get-up so here she is last summer playing with the family springer spaniel, Lucy. That day seven years ago, I saw right away what must have happened. I had lent this CD to my mom and she hadn't liked it. For reasons known only to herself and God she did not like this superb, this irresistible Fred Astaire CD, and she had shrugged it off on Margie. When I was dying to have it back! To test my theory, I looked at Emily. "Telephone call for Mr. Astaire. Paging Mr. 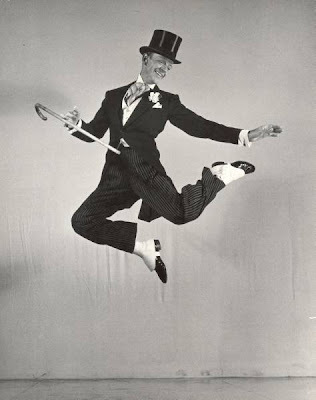 Astaire!" I started singing. That is the start of "I Can't Be Bothered Now," which was also on that CD. And she started getting all agitated and jumping around. She was about 4 then. Sure enough. She had my CD! Luckily our friend Ari Silverstein's mother gave it to me again for my wedding. Without knowing the story of how I had lost it! Sometimes life is wonderful that way. I will not lend my mother any of my Leonard Pennario records! That is for sure. Even though she had been hinting around that she wants to hear his Rachmaninoff Third. Nope! That stays here. It is a sublime recording with Walter Susskind and the London Philharmonia and no human being should die without hearing it but if she wants to hear it she will have to hear it here. Now for the business about the bread machine. Another thing my mom does is she will pass things on to you at the least convenient time. My sister Katie had bought a bread machine and it found its way to my mother's. Katie didn't have room for it, or Mom wanted to try it, or something. Anyway, there it was, and it was at my mom's house for a whole era. Then one day someone was going to Europe. I believe my mother and I were. I can't remember who exactly was going at this time. At this particular time. George, that is for you! My brother George and I love that phrase "at this particular time." We always crack up when people say it. My best guess is that my mom and I were going to Europe, I think Rome, and my sister was taking us to the airport. Because what I do remember distinctly is that as we were packing everything into the car -- tons of luggage, coats, and try not to lose the plane tickets -- the bread machine had to go in, too. "Here," my mother told Katie. "I have to give this back to you." This big bread machine in this big box, I still remember it being hefted over all the luggage and wedged in on top of the stuff in the back seat. Ach, du lieber! As if we did not have enough to worry about at that particular time. Could today's bread machine be tomorrow's fruitcake? That is a question to ponder. In my house, we are going to find out. I love the way you write. May I link you to my nauseatingly crafty blog?